MP3: Warm Ones - "Love for a Week"
Sometimes the best records are the ones that take you by complete surprise. 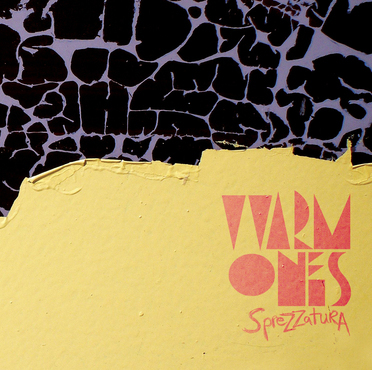 When I first listened to Sprezzatura, the debut LP from Chicago indie rock quartet Warm Ones, I was caught off guard by the consistently high quality and infectiousness of its 14 songs, which offer up a mix of glorious power pop and scruffy garage rock. I've been hooked on it ever since. The record's title means "studied carelessness," a perfect fit considering its focus on both sharp, concise songwriting and loose, natural execution. From the screamy abandon of "Bacteriostatic" to the new wave urgency of "Quiet Epilogue" to the brief, Big Star-esque "Ulysses," this is fantastic stuff that begs for repeated listens. Mark your calendar for Thursday, October 28, when the band will play their next show at Beat Kitchen. In the meantime, read on to find out what front-man Tony Sackett had to say when I recently asked him some questions about Sprezzatura, Warm Ones' background, future plans and astronaut ice cream. WCR: First off, give us some background on Warm Ones. How and when did the band start and how has it evolved to what it is today? TS: In 2003 I was playing bass in The Saps with drummer Brett Whitacre. Brett had heard and liked some home-recorded stuff I had done and agreed to play drums for six news songs of mine. I asked Devon Bryant, whom I knew from recording The Saps, to engineer the sessions with Brett and that formed the nucleus of what became the band. It remained a nameless recording project for a while because all of us were busy in other bands (Devon was playing bass with Scotland Yard Gospel Choir). Eventually we were offered a spot on a bill and Devon became the bass player so we could perform live as a trio. We did a few shows like that, met Brandon Durham after he did sound for us at the Beat Kitchen and he soon joined the band on guitar. After Brett and Brandon left Chicago to tour with different bands, I resolved to finish the record and left The Saps so I could focus on making the Warm Ones a living, breathing band. Jon Adler joined on drums and Jim Tuerk (who was playing in Brighton, MA with Devon) jumped in on guitar. That group finished the record. Shortly after we finished it, Devon left Chicago for St. Paul, MN and Mike Metz filled in on bass. Jim recently left the band so Mike Wzsolek is our current guitar player. That is where we stand today. Your recently released album, Sprezzatura, has gotten some great reviews, and it's definitely been one of my personal most-played records these days. Tell us about the recording process. Where was it done, and did you guys go in with set ideas of what type of vibe you wanted it to have? The recording process was spread out over several years. Of the original six songs I started with Devon and Brett, only "Bacteriostatic" exists. We mixed that song first for a compilation CD of local music, then a couple months later a friend mistakenly deleted all of the song files and we had to start over. The rest of the record is made up of three or four principle recording sessions. For these sessions we recorded everything live, but really were most concerned that we came away with drum takes we could build on. We did two or three weekends like that at Clava/Four Deuces Studio and one weekend in Brett and Devon’s Logan Square apartment with the drums set up in the kitchen. From those sessions we came away with drums and bass and a few guitars here and there. Devon and I felt confident we could get good vocal and guitar sounds with the gear we had, so we ended up tracking the rest in several different apartments and practice spaces around town. We would track drums for five songs in the studio, take those home and fill out the arrangements, then go do drums for five more songs, and so on. When we had everything tracked and working mixes of the songs, we went back into Clava for a couple of weekends to do the final mixes. We definitely had set ideas about the vibe or arrangement of each song going in, but we approached it on a song to song basis. Really, the only overarching theme throughout the process was to keep it simple and playful. I had just come out of my post-Jeff Buckley 6-minute ballad phase and just wanted to write short pop songs that were dumb and fun. The material on Sprezzatura is pretty eclectic, ranging from aggressive, noisy stuff like “Bacteriostatic” to catchy power pop like “Love for a Week.” Was it important for Warm Ones to have an eclectic sound or did it just develop that way? It just developed that way. Whenever we talked about these songs with each other, they were just “pop songs,” so I guess we all have a very broad idea of what that is. I also think the piece-meal way we recorded the album influenced us to consider the songs more individually and not as a whole. It was cool to hear Jeanine O'Toole from another excellent Chicago band, The 1900s, do guest vocals on “Small Spies.” How did that come about? Devon met The 1900s while he was playing with Scotland Yard Gospel Choir. Later he ended up filling in for their bassist for a couple of shows and I think that was when he asked Jeanine if she would sing on the record. We sent her the song and a couple weeks later she came into the studio and nailed it in a couple of takes. What are some bands that you would say have had the biggest influence on the Warm Ones sound? The Flaming Lips, Guided by Voices, The Kinks, My Bloody Valentine, Big Star – those are some bands off the top of my head that I can relate specifically to things we like and have tried to emulate. There are a lot. Motown singles also had a lot of influence on the attitude of the band early on. When your goal is to make concise and energetic pop songs, that’s a good place to start. What has been the most memorable of the band's gigs to date and why? 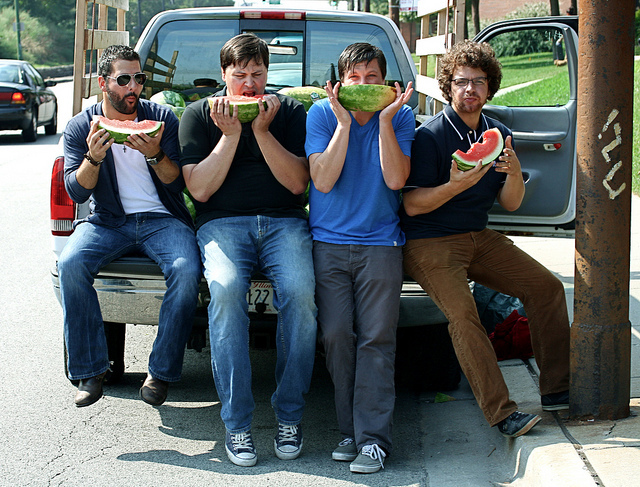 This summer we played the Milwaukee Avenue Arts Festival. We thought the stage was going to be somewhere near the general area of the festival, but were mistaken. Instead we played a stage set up in a right turn lane at the intersection of Kimball, Diversey and Milwaukee right in front of Cut Rate Liquors. The result was a crowd that was a surreal mix of our families, some friends and drunk, sun-burnt vagabonds. To look out and see my dad tapping his foot next to some incoherent shirtless dude doing a psychotic rain dance…that’s just rock 'n’ roll. I read on your website that you were offering Warm Ones astronaut ice cream for sale at your recent shows, and just wanted to comment on how awesome that is. How'd it go over? It went over well. We were giving it away at our CD release party and it seemed like some people had the same nostalgic response to it that I do. As a kid I thought it was among the most amazing substances on earth. What's next? Any more recording or shows lined up? We have a few new songs almost completely tracked and plan to go back into the studio to record five more in a couple of months. We just played the Empty Bottle and hope to get back to The Hideout this Fall (editor's note: since Tony responded to this question, the band have scheduled a show for October 28 at Beat Kitchen). For now we want to stay active locally and build on what we’ve done so far to promote the record.